Buff & Glow is out Mineral Kit that will transform your make-up routine. 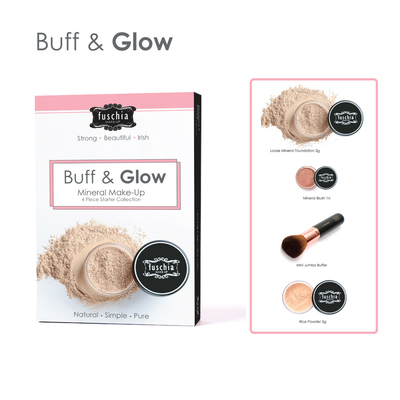 Our Buff & Glow Kit contains everything you need for a flawless application, including the fabulous Mineral Foundation itself, Rice Setting Powder, Mineral Blush Glow, and our mini Buffer Brush. Mineral makeup is a loose mineral powder foundation that is applied to the skin and built up gradually. Our famous dip dip, tap tap, buff buff method ensures a natural application, but with great coverage, so the end result is blending away any imperfections or discolouration and an all-over glow that suits every skin type. Choose from six shades to suit every skin type from bare and buff to fawn and toffee. Watch our video to learn all about the dip dip, tap tap, buff buff methid of application. You can also read our FAQ on our Mineral Magic page and learn all about our 60 Day Money Back Guarantee. There's a reason why Mineral Foundation is our best-selling product - why not find out for yourself?